Welcome to the world of HITACHINO NEST BEER. We would like to share our thoughts towards brewing. History of how Kiuchi Brewery ? the traditional sake producer, started brewing HITACHINO NEST BEER. Listen to the craftsman behind HITACHINO NEST BEER. How they brew, and commit to the quality and innovation? Kiuchi Brewery is located in Naka-city, Ibaraki Prefecture, Japan. We would like to introduce the Nukada Brew House where we produce HITACHINO NEST BEER. Nest beer & wagyu. We introduce delicious food of hitachino to the world. The 2nd brewing lab that you can learn and enjoy beer. Attention to the special limited beer available only in Tokyo Station. HITACHINO BREWING LAB. Kanda Manseibashi. An old warehouse converted soba restaurant in our brewery site. You can enjoy soba dish (Japanese noodle made from 100% buckwheat) with our beer and sake. A high-end Japanese Dining Bar for foodies where you can indulge in seasonal local dishes matched with HITACHINO NEST BEER. 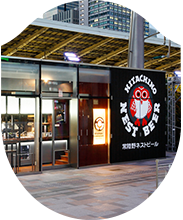 A pub where you can enjoy fresh HITACHINO NEST draft on tap directly delivered from the brewery nearby. “Hitachino Nest Beer” will open a beer cafe in the metropolitan area. The concept – “Enjoy The Taste of Hitachino”. Brew On Premises where you can brew your own beer using the same recipe and the ingredients as HITACHINO NEST BEER.